I have been going to various types of physical therapy weekly for thirty years. This “fearless experimenter” found that despite continually seeking new ways to improve my day-to-day health, I was striking out with my chronic pain. Statistics show that many of us are trying to cope with chronic pain. Many of us face various levels of chronic pain as we get older, with adults age 45-64 years being most likely to report pain lasting more than 24 hours (30%). So in addition to or instead of pain medications, perhaps it is time for all of us to get experimental with movement therapy. In fact, the method I finally found to be effective for my personal symptoms was something fairly new to me: The Feldenkrais Method. While I was skeptical at first about wasting time learning and testing yet another method, I consulted with my community and found that some of them had gotten good results from Feldenkrais. Despite some groaning that I had to commit another 1 hour a week, for 8 weeks, to something else, I put on my fearless experimenter hat and hoped for the best. Feldenkrais is a form of movement re-education; it aims to improve our self-awareness of the way our bodies move. Based on the theory that mind and body are interrelated, Feldenkrais explores how our ongoing physical or psychological patterns may constrain us. The goal is to move beyond these constraints to improve our posture, flexibility, and coordination. Each body part should participate fully in every action, so no single part experiences overdue stress. The overall result? Reduced pain and increased wellness. How does Feldenkrais accomplish these goals? The underlying concept of The Feldenkrais Method is to work smarter, rather than harder, by remaining within your comfort zone. Slow repetitions of small movements aid in developing new patterns to replace inefficient habits. The Feldenkrais Method has two approaches. Both use slow, gentle movements to retrain the body, but one approach is passive (performed by a practitioner on the student’s body), while the other is active (performed by the student). In this 1:1 session, a practitioner guides the client’s body through precise manipulation and passive movements individualized for the client’s needs, from ordinary aches and pains to more serious musculoskeletal problems. The student may lie comfortably on a table designed for the practice, sit or stand during the lesson. Through gentle touch and movement, the practitioner invites the student’s body to change the way it moves by engaging in more efficient movement patterns. For example, a practitioner may engage a student’s spinal cord through touch, and guide them from lying down to sitting upright. The student’s body may eventually learn to automatically correct posture. In these group classes, clients actively engage in guided movements as a practitioner leads them in reducing unnecessary muscular effort and improving awareness of the whole self. Most lessons take place lying down or sitting. Slow movement is encouraged, and students may repeat each movement as many times as desired within allotted time. Practitioners provide verbal instructions for sequences of movements and allow students to kinesthetically explore these movements without demonstration. This strategy allows for greater mind-body connection; students are enabled to learn, rather than taught. In a session, a practitioner may say “lower your knees in the direction of the floor” rather than “try to touch the floor with your knees”. Emphasis is placed on doing what you comfortably can, rather than straining to attain a specific goal. 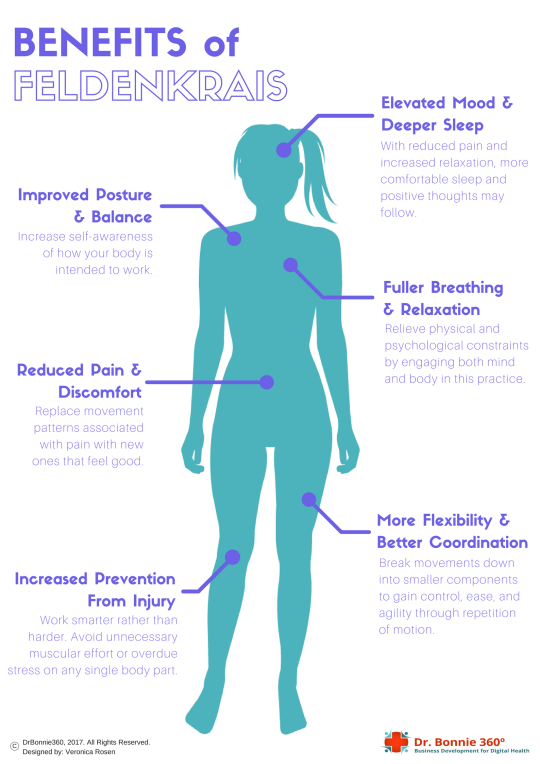 What are the benefits of Feldenkrais? Other students describe their Feldenkrais experiences here. I was personally driven to try The Feldenkrais Method by my chronic pain, but this method may be helpful to all of us. Replacing old, constrictive habits with new self-awareness may prevent future injuries and reduce aging wear and tear pain. Traditionally, Feldenkrais is directed towards combating symptoms associated with injury, aging, chronic pain, and restricted movement, but the gentle, restorative effects may improve all our patterns of movement, whether we are competing in a sport, practicing an instrument, or going about daily life. It is particularly helpful for those of us doing repetitive activities, work or play, such as typing, gardening, walking or playing tennis. What differentiates Feldenkrais from other common mind-body practices? Movement therapy is not an “either/or” dilemma. We don’t necessarily have to choose between just doing one mind-body practice or another. In fact, Feldenkrais complements other practices, such as yoga, by teaching us new tools to integrate mind and body. By breaking down movements into smaller components that don’t require as much musculoskeletal effort, Feldenkrais may actually help yoga students master a new pose that would otherwise have been unsuccessful. The two can go hand-in-hand! Current research supports clinicians’ use of The Feldenkrais Method for those interested in efficient physical performance. Single studies have shown significant positive results for increased ease and agility of movement. Additional research adds that Feldenkrais may be effective for improving balance and mobility, as well as reduce fall risk in older adults. However, due to risk of bias in these studies, further research should be conducted to provide more concrete, scientific support for Feldenkrais as this movement therapy continues to expand its reach. After 14 one-on-one sessions, this is the first time in over 20 years that my fibromyalgia pain is reduced. Having previously given up hope that my symptoms might improve, I am grateful for the progress I have already made through Feldenkrais. I only wish I had started sooner! What movement therapies have you tried to reduce chronic pain?